The beyerdynamic Orbis conference system receives a modern and efficient program. The beyerdynamic Orbis conference system receives a modern and efficient program for system configuration, set-up and control of the conference as well as further attractive additions like camera integration, local recording and web casting. The software is available in three modules. 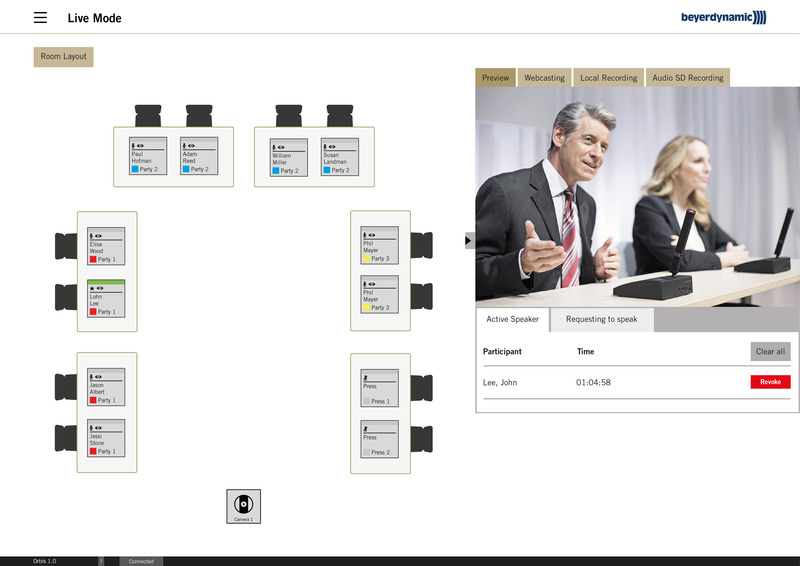 The 1st module enables not only the configuration and control of all system specific parameters in an intuitive user interface, but extends the Orbis system with more functions such as the creation of participant’s lists and the set-up of the microphone units in a room plan. With the introduction of the Orbis Software, it is also possible to set the microphone sensitivity individually per microphone unit according to the speaker and to use a dynamic speaker’s list in the request-to-speak mode. It enables the flexible system configuration and control of the conference by using a PC, laptop or Android Tablet – also in parallel operation. The base module is required for all further modules. The 2nd module includes the camera control and local recording. With the software diverse IP-based PTZ cameras can be integrated into the conference system. This enables the control of several cameras and the automatic camera sequence to the respective speaker. With the recording function video and audio signals can be locally stored and reproduced. With the 3rd module the Orbis system receives a web casting interface and therefore can be connected with numerous web casting providers. By using this module, image and sound of the conference including meta data can be transmitted live on the internet.